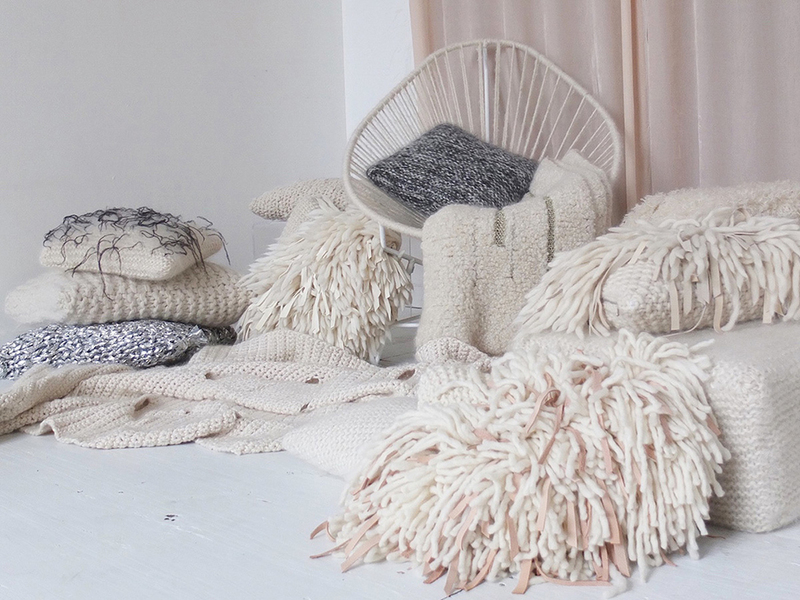 Soft, slow and sweet: Doucement (which means “slowly” in French) is an independent Brooklyn basesd textile art and design studio founded by textile artist Monica Hofstadter in 2016. 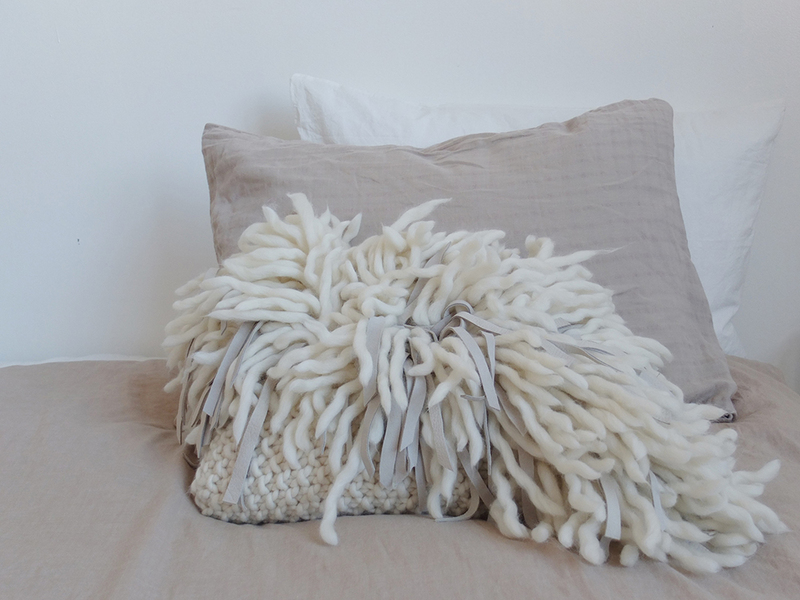 Hofstadter creates textile objects that “blur the line between minimalist art and decadent creature comfort”. Her textural creations are made by hand in New York City from beautiful natural fibers and radiant plastics, with the perspective that the artificial should be treated as luxurious and rare. 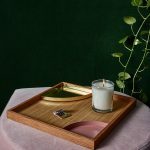 Inspired by the love of being home, creating serene moments for the senses, and the magic and spirituality of the tangible world. 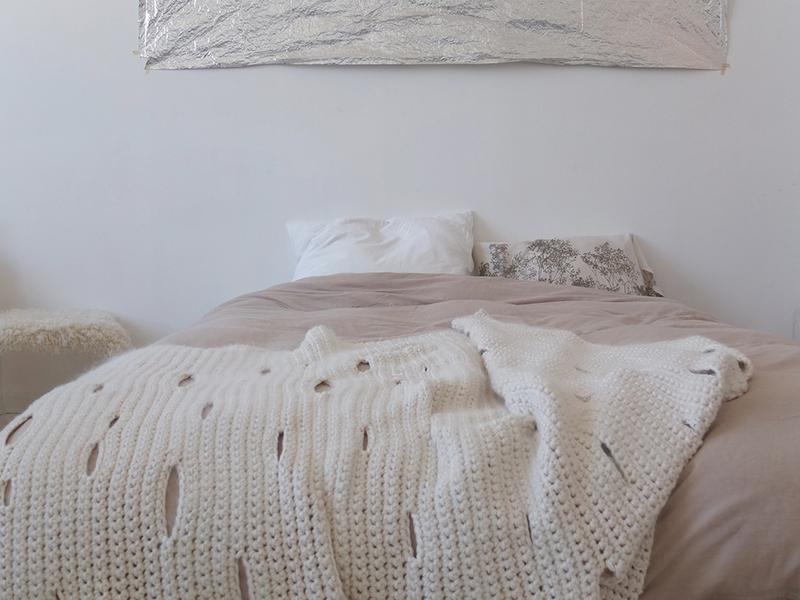 The Birkir Blanket is aheavy weight cotton blanket striped with mohair and merino wool. Little eyes as accents in the stitch help this blanket to breath making it a perfect spring, summer, and autumn layer. 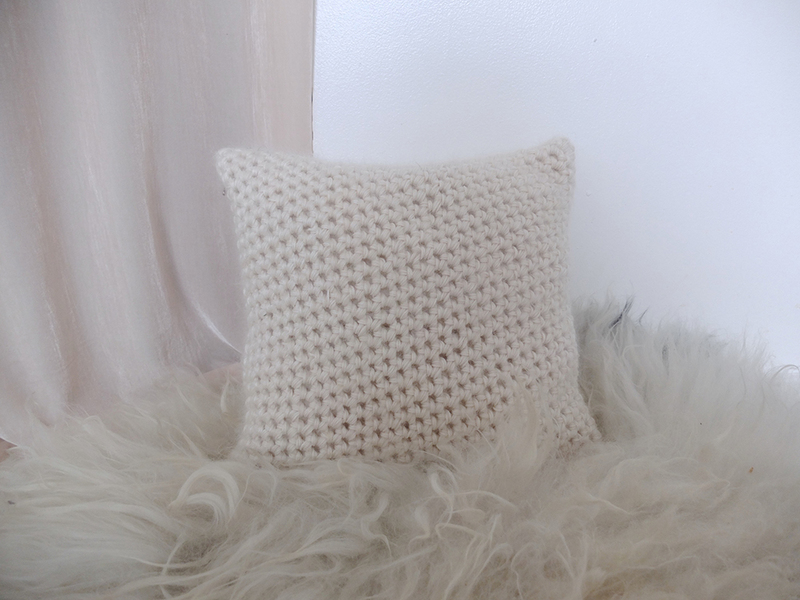 The Birkir Pillow is just so simple and soft. 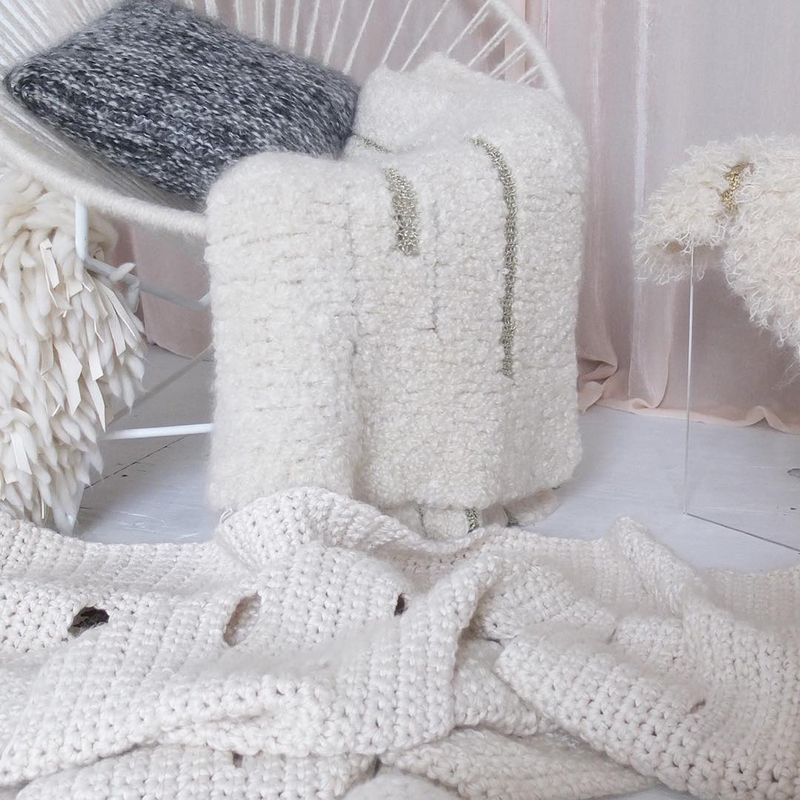 Cotton, Alpaca and Mohair marl stitched in chunky crochet by hand. 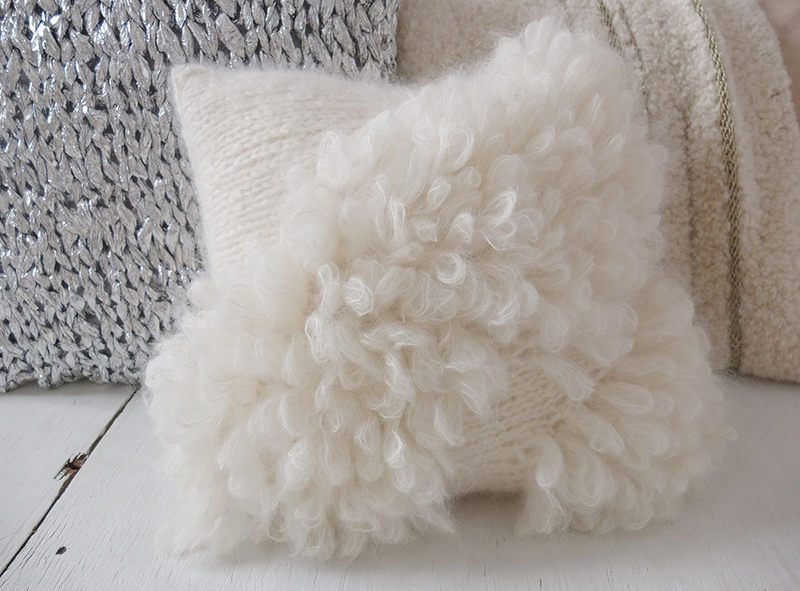 The Bloma Pillow, a textural blossom of soft and romantic loops of mohair. 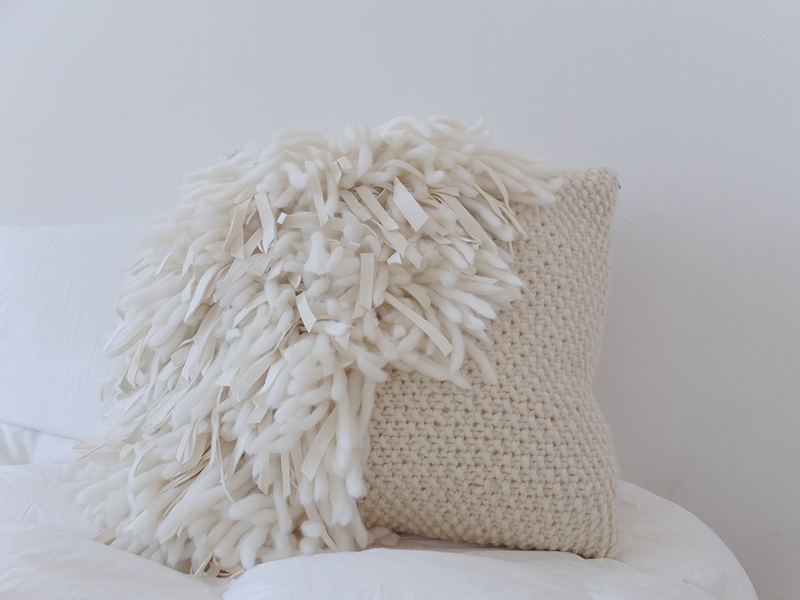 Like a little animal, the Veru Pillow brings some personality to a sofa or a bed. Partially covered in wool and leather fringe on top of a hand knit base. 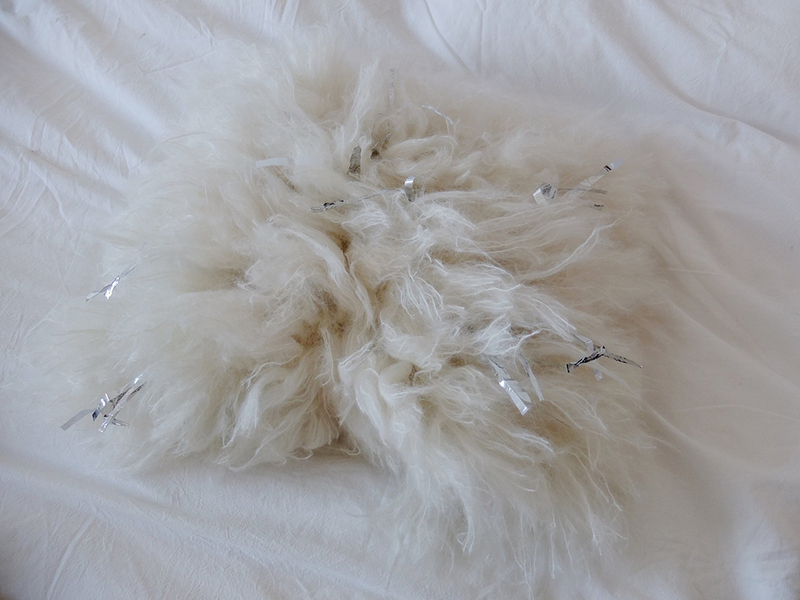 The Snow Pillow looks like ultra furry snow landscape made of fringed mohair. Hand knotted to create a three dimensional texture. 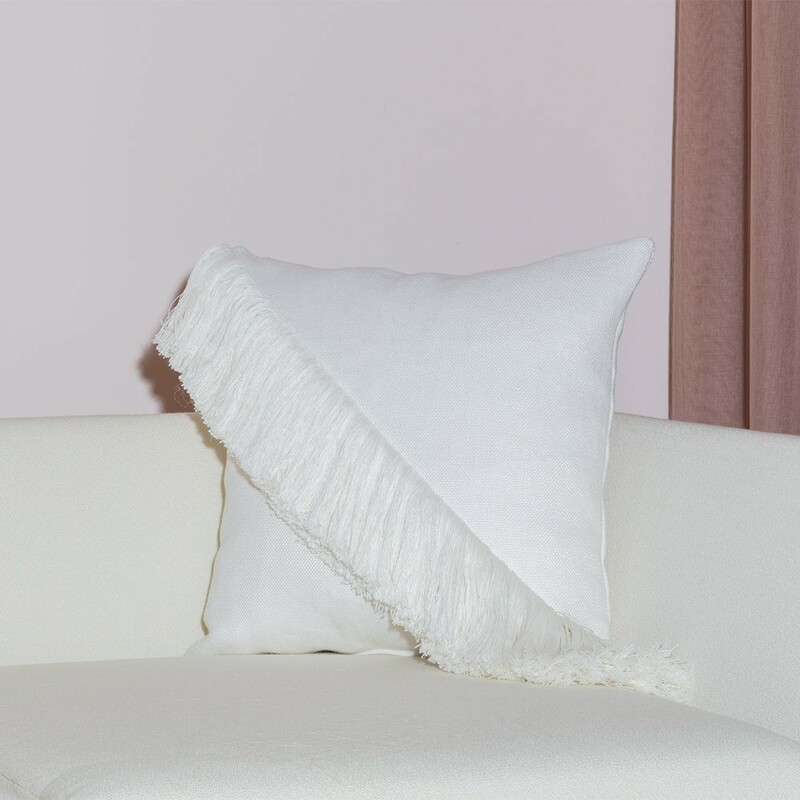 With an abundance of texture, the Big Veru Pillow brings personality to a sofa or bed. 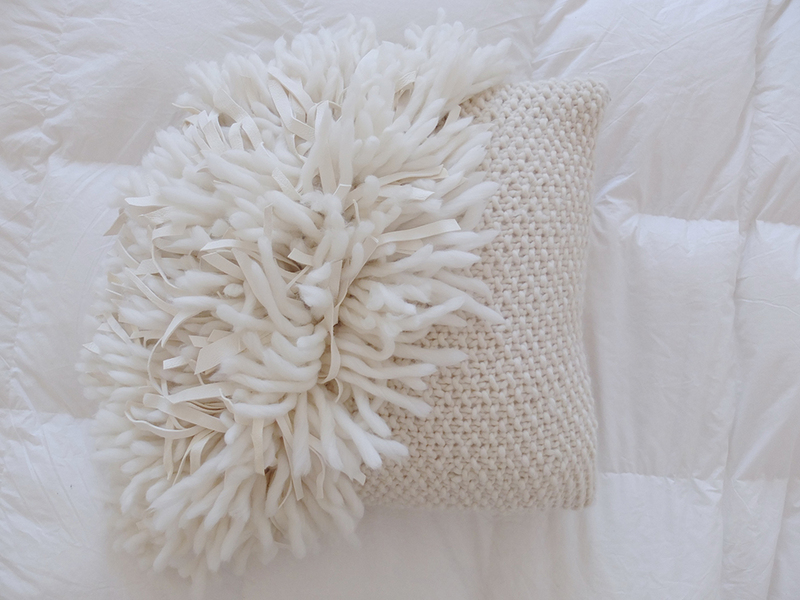 partially covered in wool and leather fringe over a hand knit base. Furthering their exploration of shapes, Hofstadter collaborated with For Reference to apply her work to shapes that highlighted her hand knitting techniques. 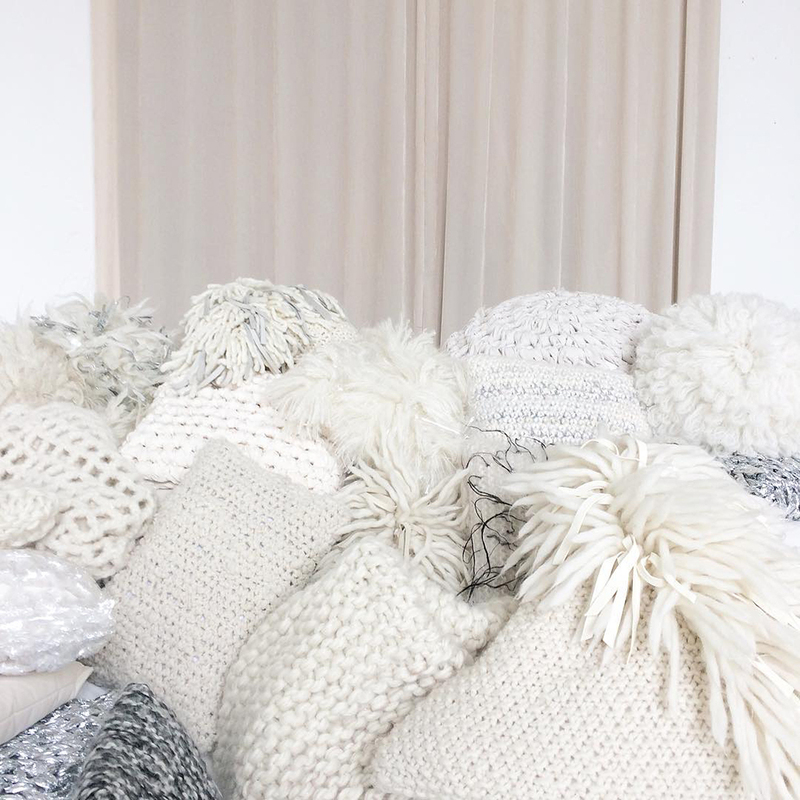 Her variations of pyramid and sphere pillows in new organic forms pair perfectly on a sofa’s soft structure. 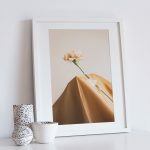 All items are vailable at The Future Perfect. 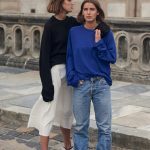 Explore all of Monica Hofstadter’s debut collection online.